In case you are planning for party rentals in Nashville, all you should do is definitely pay a visit to the web site of Big Thunder Events. We now have almost everything you need for Nashville party rentals. 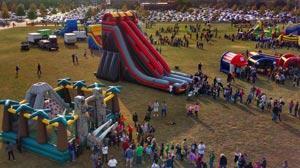 Nashville party rentals offer you the very best party rental service at a very reasonable price. Almost every year, we deal with a lot of customers; installing their inflatable party rentals together with the latest products along with other party rental trends. For much more details, you can actually come in and contact us! Our offers at Big Thunder Events include the newest Carnival Rides in Nashville. At Big Thunder Events we carry an array of carnival rides for the young and young at heart. Inflatable party rentals, like the famous bounce houses, are attractive and are actually in demand by many people especially youngsters and even for moms and dads. Our services are performed fast and easy; that's why many parents choose to get bounce house rentals from us plus the fact that youngsters love bouncing around the inflatable; it is excellent! There is no need to concern yourself with the installation as well as the after-care whenever you choose us due to the fact everything are included in our services. To order an incredibly enjoyable party you would like, you just have to put your order online or perhaps call us to ensure that we're able to speak about nearly anything you want for the party. Our company is with you in making certain that no matter what and where ever your event is, it will be a roaring success. Client satisfaction is what we want to accomplish with our offers of fun and party mementos. No need to look far, give Nashville Party Rentals a ring for all your party needs. Searching for certified bounce houses for rent in Nashville that will be perfect for your kid’s preferences is not an issue. There are many of them to pick from, whether your girl likes the Disney Princess Bounce House or even your boy wants the Justice League Bounce House. Our inflatable party rentals can also add more enjoyment to your summer camp throughout the peak summer time. Having a water slide in your sizzling summer bash will certainly increase the joyful mood. Get our water slide rentals in Nashville for your event in the summer heat and it will certainly be a hit! If you are tired of the ordinary garden variety bounce castle, you may prefer to choose Nashville Interactive Games. Inflatable oddities can be bought in to suit your needs and feel pleased along with your splash-island fascination. For more details, give us a call. In addition to our well known bounce house rentals, you also can choose from our bigger inflatable fortresses for your huge house party and other events. You can rent from our different party rental equipment like combo units, interactive units, obstacle courses and much more in case you are intending to have a big party. For large parties, we have tent, table and chair rentals in Nashville. To add more fun to your celebration, we provide Nashville concession rentals with favorite party food items. Children and adults will really like items just like popcorn, cotton candy and snow cones. The stuff you want in your celebration, the way you would like it to be, be assured that Big Thunder Events is capable of giving it you no matter what you want. Professionalism is really vital to us. We are always keeping a close eye on your celebrations to be as much help as we can to you. You'll undoubtedly want to acquire our bounce house rentals and other party rental equipment in Nashville considering that you know that we are indeed the greatest provider of bounce houses for rent. Wait no more. Employ our services without delay!